Our services give you the edge. Competition is constantly driving manufacturers to be better, faster and more resourceful. That’s why a superior supplier partner is essential if you want to keep an edge over the rest. All Seals’ new state-of-the-art facilities offer you the most advanced equipment, services and innovations. We can support you with engineering solutions, material recommendations, CAD, product design and specifications, testing, certification, custom orders and a world-wide network of resources. All that added value can keep you far in front of your competition. For more information, quick quotations, expert consultation and responsive customer service, call us at 800.553.5054. 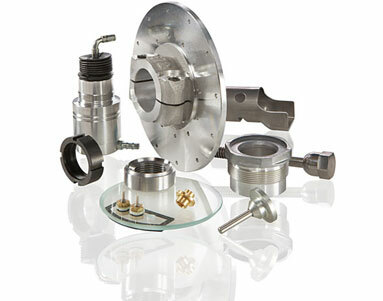 All Seals has worked with a multitude of industries and different seal applications. When you need design assistance, no matter what project, we’ve already got the experience to meet any challenge. Most projects are solved with a simple review and application of standard seal design parameters. For complex problems, we’ll engineer the ideal solution. Call or e-mail our engineers through our “Ask an Engineer” tool. Material selection is complex and crucial. Each grade of material has a unique set of physical and chemical properties that sets it apart from the others. Our recommendations consider the medium, temperature, static or dynamic motion, maximum operating pressure, environmental aspects, material costs and more. We are experts in all materials, including Viton™, EPDM, Nitrile, Silicone, PTFE and more. All Seals uses CAD software, specifically SolidWorks, to produce solid models and drawings. Solid models are the preferred medium to accurately communicate requirements. Our Solid- Works system can read numerous CAD formats. We also use SolidWorks Product Data Management to tightly control print and model versions. This software assures that the correct version of the print or model is in use at all times. 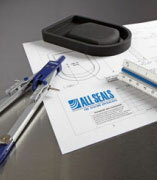 All Seals uses our advanced non-contact visual measurement equipment to take detailed measurements for our customers. Our staff can then reproduce the part in our SolidWorks CAD system. 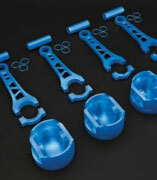 The resultant solid model can then be used to produce parts for cost analysis, design replication or testing validation. Most geometries can be measured without having to cut the part, however more complex shapes will require sectioning. Our new, state-of-the-art facilities, including warehouse, testing lab, engineering services, customer services, software systems and more. Since different part compounds look alike, we can dot them in different colors. It improves quality control by ensuring the correct compound for each application, differentiating expensive parts, and matching correct sizes. Our worldwide resources, new state-of-the-art warehouse and worldwide delivery expertise enable us to pack, ship and track your order from the moment you place it. We deliver to local areas, nationwide and off-shore anywhere. 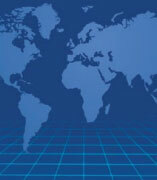 Our international resources facilitate the process. And we’ll custom kit, bar code, even set up just-in-time (JIT) scheduling. This process is primarily used in conjunction with an automated manufacturing process. 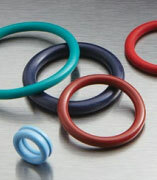 All Seals is capable of powder coating parts with several friction reducing substances. This facilitates automatic assembly and can help with identification. Available coatings include talc, silicone, molybdenum disulfide (Moly), and Teflon® coatings. 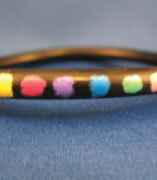 All Seals also offers wet coatings. Our Vendor Managed Inventory (VMI) assures you’ll always have the parts you need. 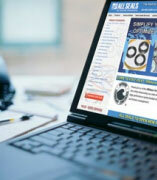 We can stock your specified parts, often ready for same day shipping. 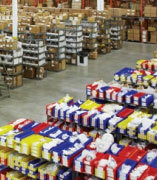 We maintain the inventory levels according to your needs. It also lowers in-process/stock-related material costs. We can also facilitate your sales and purchasing process through our Electronic Data Interchange (EDI) system. 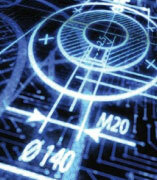 EDI speeds up the ordering process, increases accuracy and prevents errors. It allows us to directly translate your sales request into our management software system. It saves the time of working with customer service as orders are electronically put into our system. And since the system is automated, it prevents human error in the transcription process of your order into our system. Our Quality Services assure consistently superior product quality and performance. 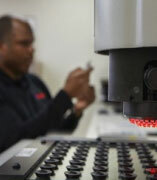 Our ISO 9001 certified quality system includes rigid incoming quality inspections, material certifications, Production Part Approval Process (PPAP) documentation, expertise, adherence to regulatory practices and more. We also offer a host of value added services – and we can accommodate all your custom quality requests. Our ISO 9001 certified quality system is an international testimonial to our best practices commitment. This certification requires rigid incoming quality inspections, documented material certifications, adherence to regulatory practices worldwide and more. It also demands constant improvements in industry standards and keeps us at the forefront. Our new inspection facility ensures all incoming products conform to specified requirements. Micro-Vu Non-contact Visual Inspection Devices automatically measure parts for industry standards or your specifications. Shore A/M Durometers measure hardness, a physical property of rubber materials. Measuring specific gravity quickly verifies the compound type. The Production Part Approval Process specifies the requirements for a new or changed part. It identified any production process weaknesses and assures all design and engineering requirements are met. Documentation includes Failure Mode and Effects Analysis, Control Plan, Process Flow Diagram and Part Submission Warrant. Our customers often need services that require too much additional capital to handle themselves. Our part enhancement services include part washing, part coating, even color coding for more accurate part identification. It saves you costs while it boosts your quality and productivity. 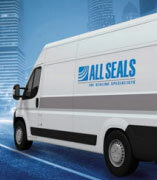 All Seals stocks and ships over 25,000 different part numbers and over 500,000,000 total parts each year, with unprecedented accuracy and timeliness. Our Electronic Data Interchange and Vendor Managed Inventory streamlines and speeds up your ordering process while it helps you control inventory levels and track your orders. No matter how complex, demanding and challenging your needs, count on All Seals to deliver 100% satisfaction.